I'm certain you've noticed that I love jewelry with lots of curly cues. 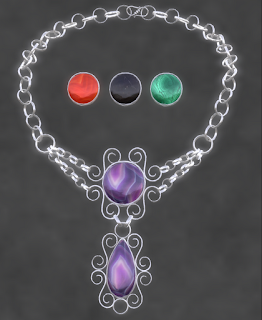 Here is a fine example--the Oracle Necklace & Earrings, ornate silver with texture changing stones in purple agate, fire agate, black tourmaline, and malachite. I like this one. The green malachite would look great with your St. Patrick's Day outfit! I'm also wearing a beautiful new dress from Aleida, and new hair from Diva. 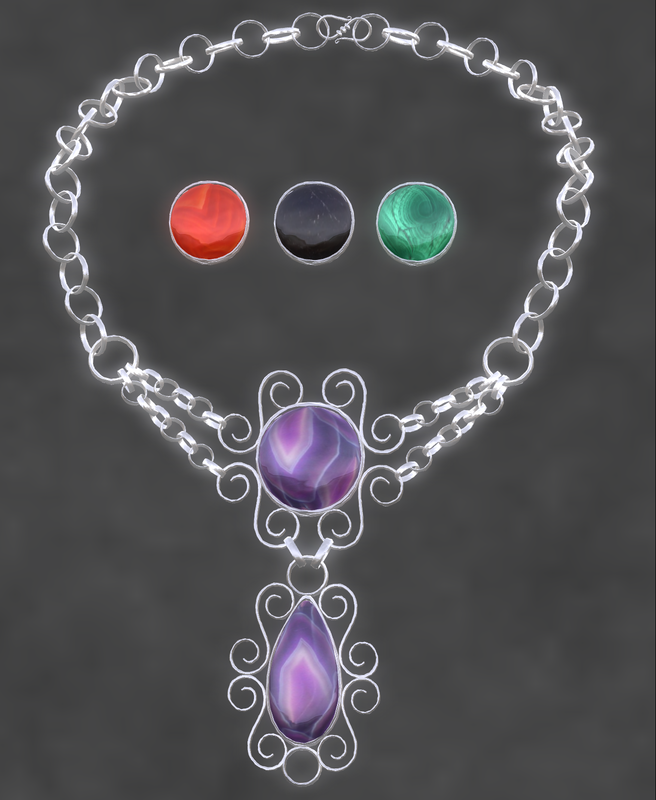 Jewelry: ELEMENTAL JEWELRY Oracle Necklace & Earrings, silver with texture changing stones. On sale the weekend of March 17 for 60L each--the green malachite would look lovely with your St. Patrick's Day outfit! Hair: Diva "Diva2", onyx. Group gift. Skin: Curio Jewel Gold Tones, Dark Shell, Amethyst 1. Purchased full price. Dress: Aleida, Antonia poofy dress, plum. Purchased on sale. A Dreaming Rose: http://laroseromance.wordpress.com/2012/03/15/sparkling-spring/. Kidman matched the purple agate set with a complementary yellow dress--lovely combination.